Many primates produce vocalizations when initiating travel. These “travel calls” are often acoustically similar to vocalizations unrelated to travel, and listeners appear to rely on a shared context with callers to correctly interpret the calls. 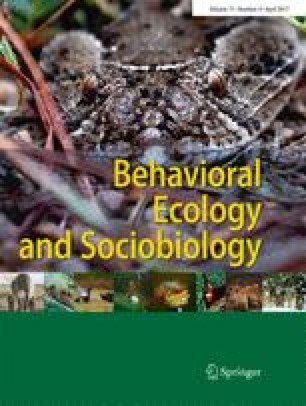 When individuals use vocalizations to coordinate movement with out-of-sight group mates, however, such pragmatic cues are unavailable. Under these circumstances, effective communication may depend on more informative acoustic signals. Here, we investigate travel-related vocalizations that occur when callers and listeners cannot see one another: long-distance calls given by wild bonobos (Pan paniscus). We find that production of a specific call combination, the “low hoot-high hoot,” is more likely than a high hoot alone to be produced prior to travel. Furthermore, the low hoot-high hoot combination is more likely to result in inter-party recruitment—that is, individuals from other parties are more likely to approach the caller. We also compare these observations with previous research and find that bonobos appear to use distinct call combinations to facilitate specific movement patterns common in fission-fusion social structures. These results suggest that use of call combinations allow bonobos to convey more specific information than do single call types alone and that this additional information allows for effective communication between out-of-sight parties. When an animal hears a conspecific vocalization, it is able to respond appropriately by integrating information about the call type itself and the context in which it was given. Vocalizations produced by out-of-sight individuals, therefore, present a challenge: how can a listener respond appropriately with only partial information about the context of the call? In situations where distant bonobos are communicating with one another, we find that call combinations are potentially more informative to listeners than single call types alone. The use of call combinations in such situations may allow listeners to respond appropriately to conspecific vocalizations even with ambiguous information about the context in which the call was produced. The online version of this article (doi: 10.1007/s00265-017-2301-9) contains supplementary material, which is available to authorized users. We thank the Institut Congolais pour la Conservation de la Nature (ICCN) for permission to conduct research in the Democratic Republic of Congo. We are grateful to Lys Alcayna for data collection in the field and three anonymous reviewers for comments and suggestions. The study was conducted in accordance with the current laws in the USA, Germany, and the Democratic Republic of the Congo. Research was approved by the Animal Care and Use Committee of the University of Pennsylvania (Protocol no. 804117). This research was funded by the National Science Foundation Graduate Research Fellowship (IS) and grants from the Leaky Foundation (IS and ZC), the Department of Psychology at the University of Pennsylvania (IS), National Geographic Society (RMS and ZC) (Grant #9115-12).